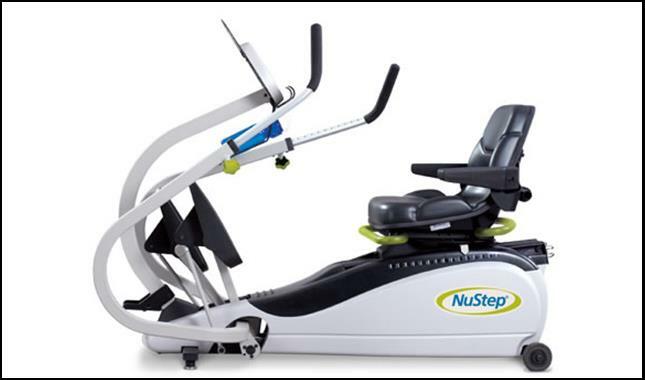 The NuStep T4 (TRS 4000) has been the most popular recumbent cross trainer in our facility. It combines a comfortable seated position with a smooth stepping motion. It provides simultaneous upper and lower body motion to work all the major muscle groups, helping all users to burn calories, build strength, and improve their overall cardiovascular fitness. The T4 simulates a natural walking motion while eliminating undesirable joint stress and promoting functional fitness. Its ergonomic design accommodates nearly every body type and size, and it includes a swivel seat for easy transfer. It ensures safe and effective treatment of individuals within a wide range of ability levels. By enabling independent control of step length, resistance level, pace, and exercise duration, the T4 provides treatment flexibility for our therapists and a greater feeling of control and independence for users. Exercise on a NuStep can accommodate our patients' unique needs and help them make functional gains. The NuStep’s inclusive design make total-body strength, cardio and functional workouts possible for virtually any user, including many who use a wheelchair.